A warm and congratulatory celebration capped off an exciting first year for Education First’s newest region, Boston. We spoke with Regional Director, Chi Le, about Boston’s inaugural scholar selection. Originally from Vietnam, Le was the recipient of scholarship support that enabled her to study in Singapore, then in the United States. She feels very fortunate to have received this support and was looking for an opportunity in education that would allow her to pay it forward. Education First Executive Director, Chris Bryan, was in Boston building relationships with schools and meeting the team of new volunteers in January, shortly after Le happened across the organization online. After a visit with Bryan to a participating high school, Le was convicted about stepping into the regional director role and supporting the Education First mission. Her leadership has guided the Boston volunteers in building school and community relationships, and ultimately the selection of the region’s first-ever scholarship recipients. Boston volunteers deliberated for hours over the final selection, according to Le. Beyond the winners’ academic achievements, Aline Correia and Caina Damestoir exhibited an incredible ability to overcome obstacles and both have inspiringly ambitious goals. 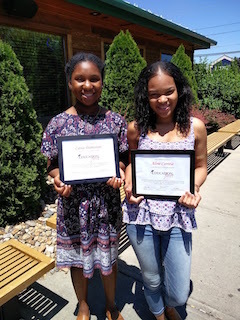 That determination and tenacity will serve these scholars well as they begin their college careers at Bridgewater State University and Massasoit Community College, respectively, this fall. 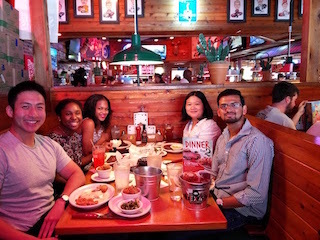 In July, volunteers and scholars joined together to celebrate. Le was struck by a comment their primary scholarship recipient made during the event: that while she is grateful for the scholarship, perhaps what she appreciated more was the relational and college coaching opportunities offered by Education First. She remarked that it was a good feeling to be entering college knowing that she won’t be going through it alone.